Hi, my name’s Katie and I live in Brighton, well, Hove actually to use a local joke. This is my first mini protest banner and I feel very proud for having produced it. 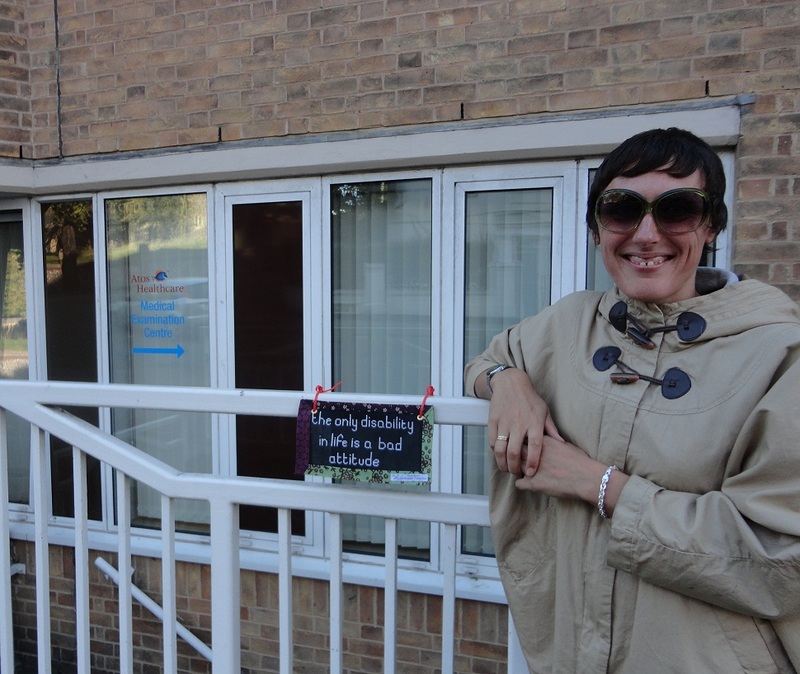 I came across the Craftivist Collective quite recently via Fine Cell Work, a charity that I’ve been following for the past few years. I volunteer as an art worker in a mental health setting and I specialise in textiles and stitch. I very much appreciate the therapeutic value of craft, as it’s helped me in my recovery enormously. When Fine Cell Work brought the Craftivist Collective to my attention via Rachel Tavernor’s ‘Stitched Stories’ film I really felt I’d come home. The Collective’s soft approach to activism fit with what I believed and gave an outlet for my views via stitch. 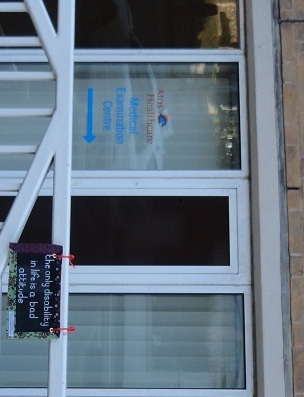 I put my mini protest banner in place outside the Atos assessment centre on Dyke Road in Brighton. Atos Healthcare are the company contracted by the Coalition to reassess disability benefit claimants. The current reforms are an issue very close to my heart. I have a mental health diagnosis and have been claiming benefit since my diagnosis 9 years ago. I feel very uncomfortable about how the government is going about reassessing claimants and wanted to show this somehow. 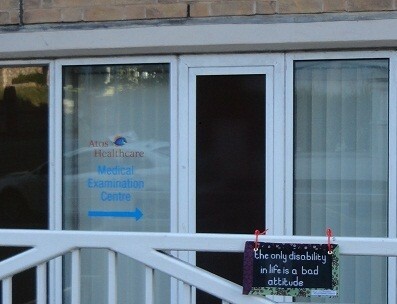 I stitched the message “the only disability in life is a bad attitude” onto my banner mainly because I believe it. I have a diagnosed condition myself but don’t really understand myself to be disabled, I have certain limitations which I have to respect. It also conveys my belief that ‘disabled’ people should be regarded as equal in our society, let’s not forget the post-Paralympics feeling, and that actually a certain amount of education and attitude, taking responsibility for one’s place in society, can help us overcome any perceived barriers. Whilst I can understand that cuts need to be made, I strongly disagree with a procedure that demonises disabled people and treats them as numbers and targets rather than individuals. My claiming has given me the space to recover and rebuild my life after a very traumatic time. Without it I really don’t know where I’d be at all. I’m lucky in that I have been able to maintain my health and am now very close to being employed in an environment that will suit my needs and take my condition into account. However, I’m very aware that I may well be in the minority. I think I personally benefited from this process in several ways. I stood up and said something about an issue which is very important to me and I did it in a way that stayed true to myself too and used my creative skills. I had to research and then produce the banner to a standard that I was happy with and that fulfilled its objective. And, bonus of all bonuses, I found the Craftivist Collective and became involved with a movement and a group of likeminded people that I hope continues for a long time to come. From installing my banner and then documenting it on the internet, I hope it was perceived as something current, relevant, important and true but also non-threatening because of the colourful and eye catching format it was presented in. I put it in place on Saturday afternoon and by Tuesday it had come down so it didn’t last long and whilst I’m disappointed that more people didn’t see it in the flesh, I feel it must have accurately delivered an important message to the Atos office. I’m thankful for the opportunity to express myself in this way and I’m sure it won’t be my last mini protest banner! Written by Brighton & Hove Craftivist Katie Blackwell.